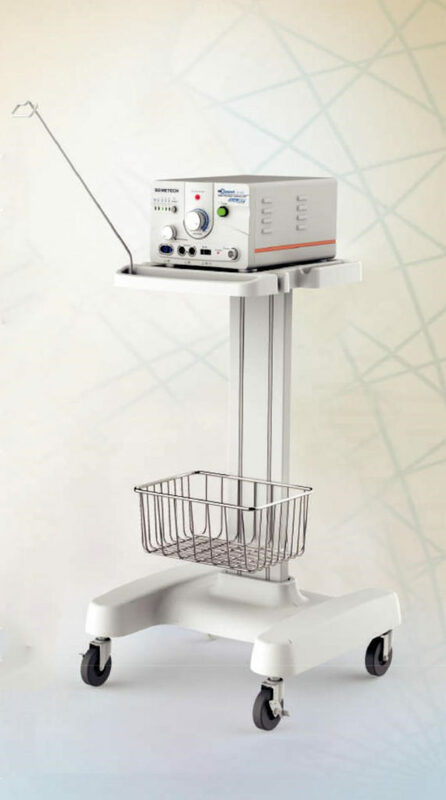 What is the 4MHz Radio Frequency Surgical Unit? Dr.0ppel’s electrode is not being heated by itself. 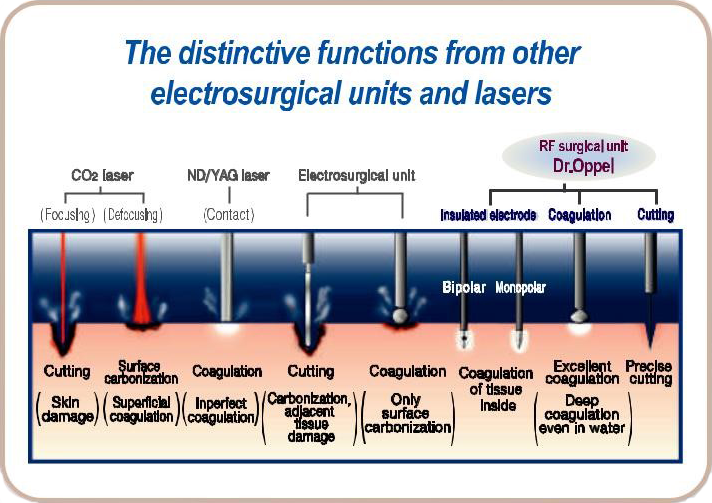 Electrode lets the cellular tissue produce the joule heat, and operates hemostasis, cutting, and coagulation. 4MHz radio frequency makes possible precise cutting and deep coagulation even in blood. There is no carbonization and damages to the sumounding cellular tissue by electric spark, and the safety secured. 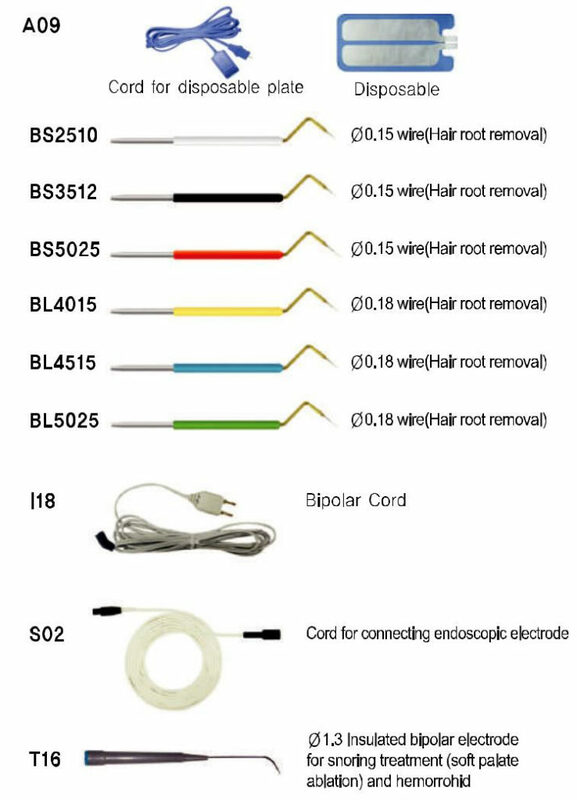 Specially developed various Bipolar and Monopolar electrodes for OB/GYN,PS/DER, Urology has outstanding performance in Micro Surgery by their excellent output time function. Cause of residue and relapse of columnar epithelium in erosion cure. Since there are lots of unexpected cases when nabothian cysts are deeply formed in a patients cervix, even though columnar epithelium is defected with dmg, cauterization, and cryosurgery, the perfect cure is said to be hard due to the diﬁculty of’ Ingression of squamous epithelium resulting’ In insutﬁcient removal of columnar epithelium. For perfect removal of erosion, 5mm depth of coagulation’ Is needed. It’s a way of coagulation necrosis to the 5mm depth of tissue, when the radio frequency cunent ﬂows from electrode, passing tissue, to the patient plate, by producing joule heat on the tissue itself close to electrode. It’s very hard to make I‘ ‘ necrosis with cauterization or cryosurgery I bemuse no deep coagulation is mpable. However, coagulation necrosis is perfecity achieved in the coagulation with radio frequency current because electrode lets the tissue itself pmduoe joule heat. 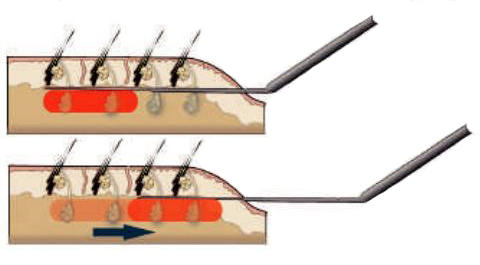 First, insert ¢6mm semi-ball type electrode into the as to 1—1.5Cm depth and start coagulation until boiling noise is heard, and then rotate electrode and slide all areas of erosion. In addition, perform coagulation on the normal squamous epithelium of ectocervix region to be 2mm—5mm overtapped. 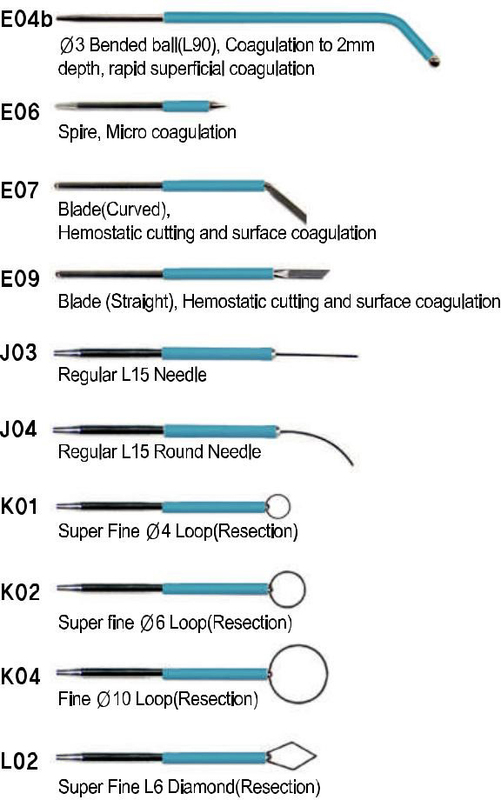 The coagulative depth is decided by the electrode size and the device is designed to make different coagulation depth by the electrode size as above. As a rule, no anesthesia is needed. At times. there are some patients who feel painful, but most are operated easily without anesthesia. OnIy nulliparous woman is occasionally needed for that. seperation for 3 weeks until the blood vessel closes up. No report has been made about side effects such as infertility and atmia of cervix unused by excessive coagulation. Different from laser treatment, radio frequency coagulation replaces the columnar epithelium with squamous epithelium completely in 4—6 weeks, also shown clearly in the colposcopy. Only small bleeding, but no massive one, may occur in the course of healing. Capable of a simple operation on an outpatient basis. TIssue sample is used for pathol reading. No general anesthesia is needed. nization procedure takes only several seconds after Iowl anesthesia. (10 seconds in conization and 3-4 minutes in coagulation). No suture is needed after conization. Short healing period (4—6 weeks). 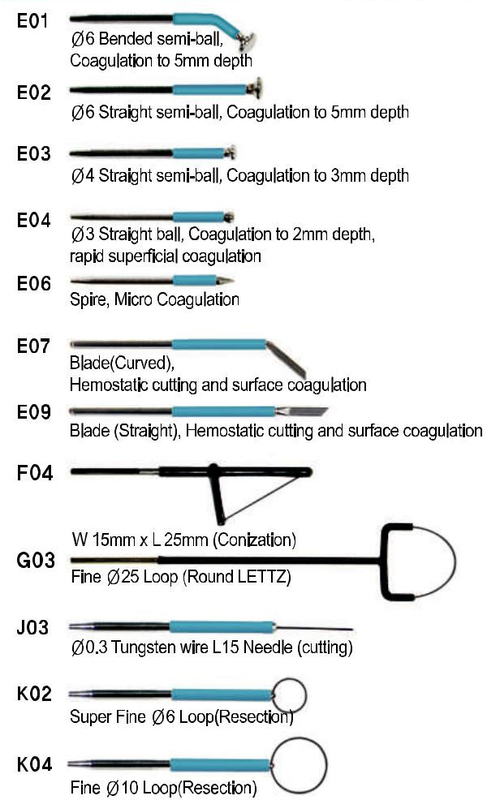 Comulation is performed for bleeding control and necrosis of the remaining lesion aﬂer conization. Firstly, place a patient on the operating table and vaginal douche. And then ,place the patient plate on the hip and expose the cervix. Secondly, after setting a conization electrode in the hand piece, start the conization from the part where no lesion is inferred to exist, and operate without a break. In this case, to proceed property, cut by rotating conization electrode at 180 degrees, and then smp off from the foot pedal. Continuously, keep operating the rest part of 180 degrees after changing handling form. After conization, coagulate the out part widely by a (56mm bended semi-ball electrode. This is the purpose of necrosis after conization for the wony some where the lesion remains. Vaporize by using needle electrode after setting timer for continuous and output power 8 ~ 9. It hardly leaves a scar since the sunounding tissues are not damaged. Applicable electrodes : C10 (Insulated coagulation electrode(end outttatiy). Applicable electrodes : K, L, N, 0 electrodes. 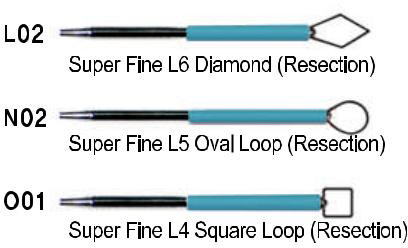 Resect by using loop electrode or diamond electrode after setting timer continuous and output power4 ~ 6.